Members of Molissa Fenley and Company performing in "Energizer." Stamina. That’s what Molissa Fenley became most famous for, not long after she began performing her own works as a 22-year-old choreographer in 1977. Now a month shy of 59, she’s still at it, dancing with no signs of fatigue in a premiere and two reconstructions that began a run at New York Live Arts on Wednesday. Molissa Fenley and Rebecca Chaleff performing in "Found Object." 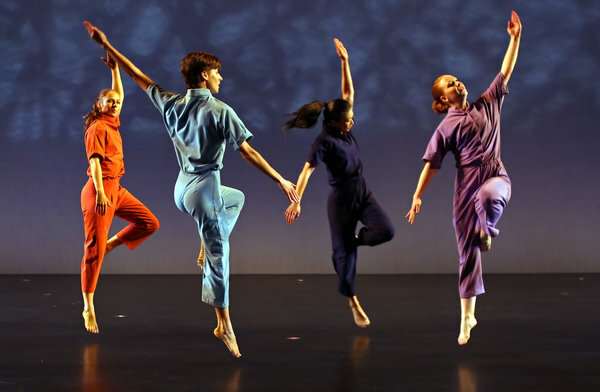 The program’s earliest selection came last: “Energizer,” from 1980, the piece that Anna Kisselgoff, in The New York Times, hailed as “the dance of the future.” Not seen in its entirety since 1982, it’s a workout: 15 nonstop minutes for four women in jumpsuits, a 10-minute duet and another 15 minutes for the quartet. It was reported, back then, that Ms. Fenley preferred to jog rather than take dance class. Yet “Energizer” is more than a workout. Its spatial patterns repeat and vary in mathematically complex ways, and the movement vocabulary ranges more than the dynamics. While footwork is mainly for locomotion, the arms are very busy, maddeningly so; semaphorically speaking, these performers are motormouths. A suggestion of tribal drums in Mark Freedman’s pulsing score matches hips that sway stiffly. Rare flashes of clarity and texture accentuate how the dancers seem not to have time or energy for those things. Ms. Fenley’s 1989 solo “The Floor Dances” is in a radically different mode. Within a circle of stones, she sits and kneels and lies back but does not stand. (It’s still about the arms.) The first part of Gorecki’s Symphony No. 3 — chosen before it was hugely popular — floods the stage with an ocean of grief, and the dance, created soon after the Exxon Valdez spill, evokes a bird trapped in oil. With winged poses, stillness, interruptive spasms and a motif of bringing a hand in a beak shape to her lips, Ms. Fenley becomes animal with affecting empathy. Yet she’s human, too, rotating a leg just above the floor as if to test its range of motion. (Her age contributes a layer, and she hasn’t performed this solo since a knee injury in 1995.) Where “Energizer” is manic, “The Floor Dances” is thinly spread, almost anti-dramatic in its tilt toward drama. The music rises, but Ms. Fenley does not. The program’s premiere, “Found Object,” swerves yet again. Ms. Fenley composed it by soliciting instructions from the writers John Guare, Joy Harjo and Rudy Wurlitzer. A marvelous prop by Jene Highstein — white gloves that protrude from a board backing, stopping the arms short with a flat plane — add interest, as do the whistles, blips and the backward-sounding singing of Erin Gee. Mr. Guare’s ironic juxtaposition of flower arranging and the Geneva Convention rubs profitably against Ms. Fenley’s lack of irony. “Found Object” isn’t the dance of the future, but it has Duchampian intrigue and it allows Ms. Fenley’s dancers to demonstrate the precision and finesse missing from “Energizer.” It seems that she could go on forever: that’s what critics wrote about Ms. Fenley in the ’80s, and it still applies. I would call her the Energizer Bunny of postmodern dance, but she’s isn’t banging the same drum, and the bunny has been going only since 1989.